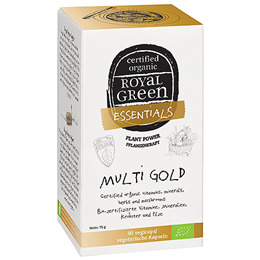 Royal Green Multi Gold provides vitamins, minerals, herbs and mushrooms in 100% certified organic form. Free of synthetic ingredients, preservatives, sweeteners or flavourings. Suitable for vegetarians and vegans. Experience the power of nature! Red algae* (Lithothamnium calcareum), capsule: HPMC, sea lettuce extract* (Ulva lactuca), organic plant mix* (holy basil extract [Ociumum tenuiflorum], amla extract [Emblica officinalis], guava extract [Psidium guajava], curry extract [Murraya koenigii] and lemon extract [Citrus limon]), amla extract* [Emblica officinalis], reishi* (Ganoderma lucidum), shiitake* (Lentinula edodes), maitake* (Grifola frondosa), green tea* (Camellia sinensis), turmeric* (Curcuma longa), ashwagandha* (Withania somnifera), maca* (Lepidum peruvianum), cultivated mushroom* (Agaricus bisporus), rhodiola* (Rhodiola rosea), Asian ginseng* (Panax ginseng), sunflower oil* (Helianthus annuus), anti-caking agents: magnesium carbonate and silicon dioxide, knotted wrack* (Ascophyllum nodosum), ginger* (Zingiber officinale), cinnamon* (Cinnamomum verum), black mustard extract* (Brassica nigra), black pepper* (Piper nigrum). 2-4 vegicaps per day, preferably with a meal. Food supplements should not be a replacement for a varied and balanced diet, and a healthy lifestyle. Don`t exceed the recommended daily dosage. As with every dietary supplement: consult an expert before use in case of illness or medicine usage. Do not use during pregnancy and lactation. Consult your doctor or pharmacist in case of concomitant use of anticoagulants or antidiabetic treatment. No prolonged use without professional advice. Below are reviews of Royal Green Multi Gold - 90 Vegicaps - Best before date is 29th May 2019 by bodykind customers. If you have tried this product we'd love to hear what you think so please leave a review.